This post is sponsored by Hebrew National via Mode Media. Fourth of July is right around the corner… are you ready? 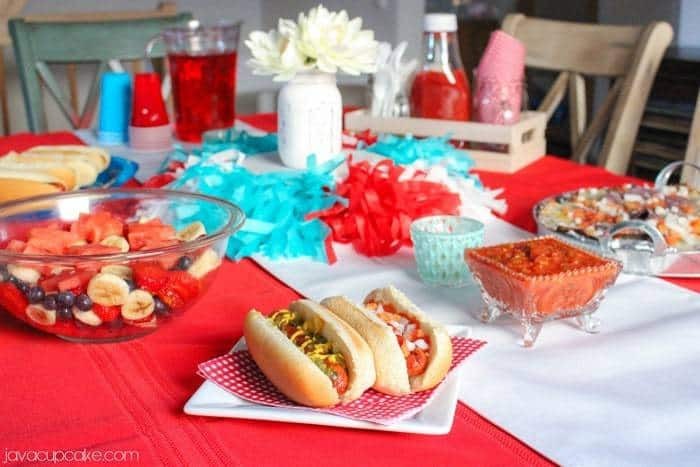 Here are some fun, easy ways you can celebrate America’s Independence by hosting a Fourth of July Soiree! Planning for this party was pretty easy since our Nation’s colors are Red, White and Blue. To mix things up a bit, I decided to go with a light blue instead of the traditional dark blue for the party color scheme. I set the table with a red table cloth with a white runner and set out light blue coasters around the table for drinks. The table centerpiece is made of several tissue paper tassels placed around a short 8 inch round cake plate to add height. I topped the cake plate with a white painted mason jar and silk flowers. Simple, festive and super cute! For the food, I had to go with a classic… hot dogs! I had my husband grill up my favorite Hebrew National All Beef Franks for the soiree and then served them with a variety of toppings. 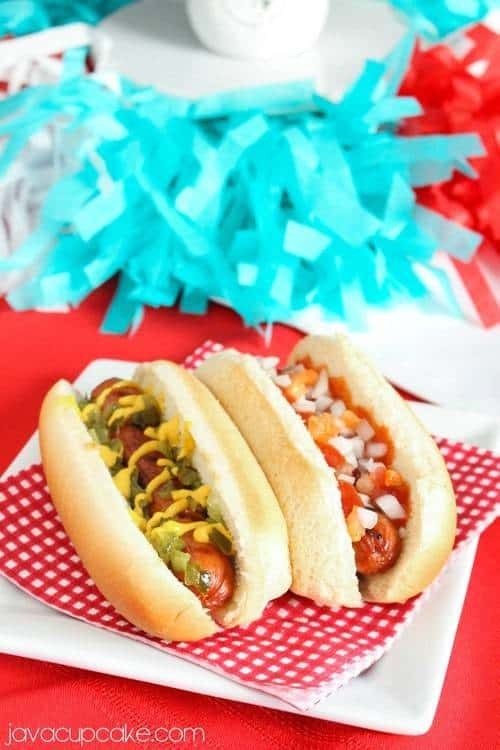 Ketchup, mustard, onions, tomatoes, and relish… just to name a few! Keeping with the patriotic theme, I served a red, white and blue fruit salad. 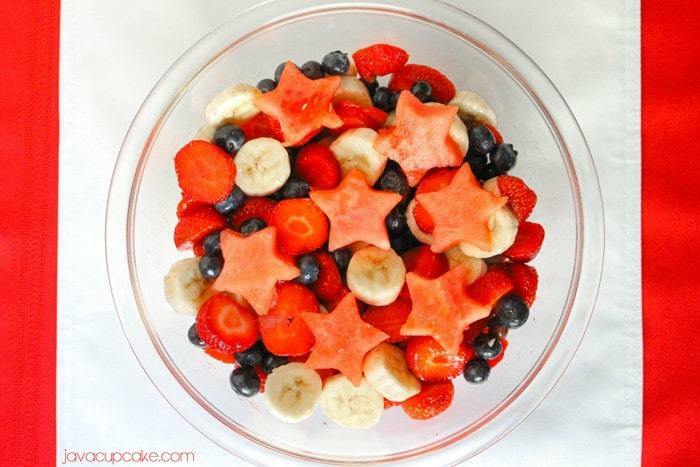 This side was super easy to toss together and features fresh sliced strawberries, bananas and blueberries topped with watermelon cut into star shapes. I used a small cookie cutter to cut the melon. Finally, I made a big plate of nachos… red, white and blue nachos! I melted white pepperjack cheese over blue corn tortilla chips then topped it all with fresh diced onions and tomatoes. 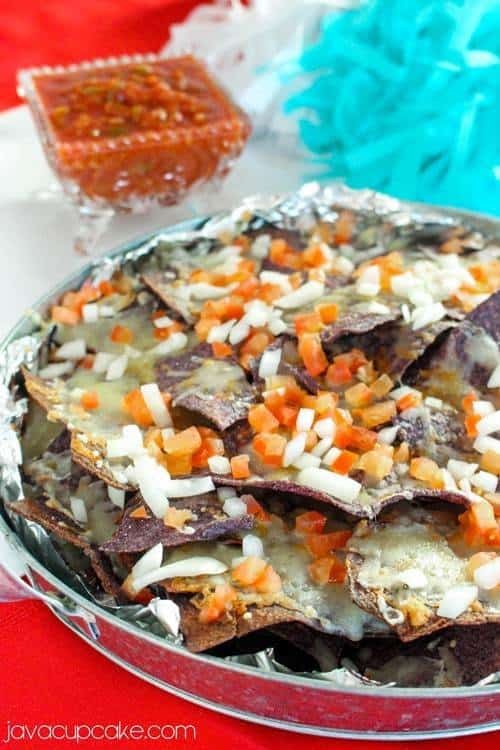 Served it with a tomato salsa and these nachos were ready to party! 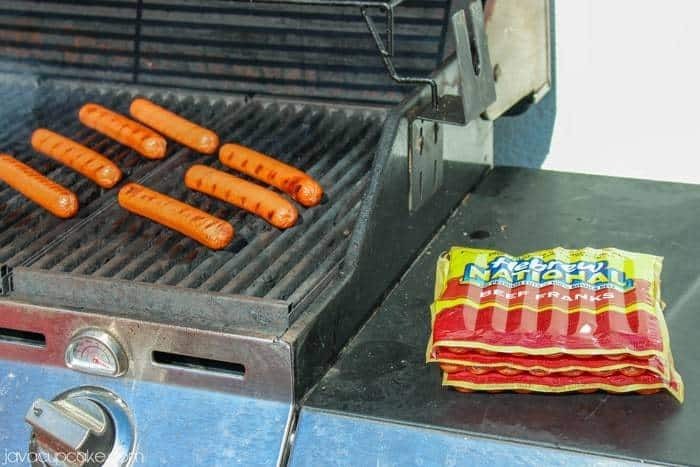 Note: The combination of franks and these toppings may not be Kosher. During the party, my guests enjoyed the food while rocking out to the best of the best patriotic music. Here’s what was on my playlist! How will you be celebrating the Fourth of July this year? What makes a Hebrew National kosher hot dog premium? It’s all about what makes the cut (And what doesn’t). We’re choosy about what goes into our franks – we use only premium cuts of 100% kosher beef from the front half of the cow and then choose the best from that. No artificial ﬂavors, colors, ﬁllers or by-‐‐products. When your hot dog is Kosher, that’s a hot dog you can trust! For more summer fun with Hebrew National, visit facebook.com/hebrewnatonal. So many fun ideas to celebrate the 4th! Everything looks so festive and fun! Awesome patriotic party ideas. July 4th is one of my favorite holiday’s. I love your music suggestions. Thanks for sharing this! Seriously nothing better than a simple fruit salad!